An entire colony of painted storks deserted Keoladeo mid-season this year. Is the wetland dying? SOMETHING WAS amiss when veteran bird watcher Abrar Khan entered the Keoladeo National Park in mid-January. It was unusually quiet for this part of the year. “Earlier, when birds would chirp, nothing else could be heard,” he recalls. A retired range officer of the Bharatpur wildlife department, Khan knows the park intimately. He remembers the days when thousands of painted storks and other birds would visit the park in Bharatpur district of Rajasthan. Although their numbers have dwindled over the years, nearly a thousand piainted storks did visit Bharatpur this season, but they were nowhere to be spotted. Khan was acompanying ecologist T K Roy, who works with the South Asia chapter of Wetlands International. Roy was conducting a survey as part of the Asian Water Bird Census (AWC). To his surprise, he found only two painted storks in the park, a World Heritage Site. The painted stork is a local migratory species that usually flocks from southern India to Bharatpur in October every year. The birds leave after April for south India, where they stay for some time.They return in small groups in August, September and October for nesting, breeding and raising chicks. Painted storks are usually found in the central part of the park, where water is abundant. The painted stork colony in this part, identified as D block, was once counted among the largest of its kind in South Asia. “In 1958, when I was assisting Salim Ali, 10,000 storks were roosting at this spot,” recalls Khan. But this year, the entire colony of more than 1,000 birds left en masse in October, leaving behind their nests and eggs. The eggs were destroyed by crows and other scavenger birds. Painted storks are classified as nearly threatened species and their numbers are declining. Ecologists believe that the disturbance in breeding this year would affect their population. For stabilised population breeding should happen every year, says K Sivakumar, senior scientist with Wildlife Institute of India (WII) in Dehradun. So why have the birds deserted the park this year? The reasons vary, depending on which side of the fence one is on. In Roy’s report, the main reason cited is climate change. “The fifth assessment report of the Intergovernmental Panel on Climate Change (IPCC) released in March 2014 said that many plant and animal species had moved their range, changed numbers or shifted their seasonal activities as a result of warmer temperatures. That is what has happened at Bharatpur. Global climate change has resulted in late migration and lesser population,” says Roy. Construction inside the national park could be another reason. According to several accounts, in October, the forest department had allowed dozens of trucks and earth diggers for two-three days inside the park for construction of mounts and mud platforms. These were made to give bird watchers a better and a closer view of the birds. “Painted storks live in colonies and if their habitat is disturbed, they would leave en masse,” says Sivakumar. “Birds should not be disturbed during nesting and breeding. ” The park authorities deny disturbance could be the reason. Field director Bijo Joy says, “Deficient monsoon and shortage of water are responsible for the birds’ exit.” In the last monsoon rainfall in Bharatpur district was 21 per cent below normal. This is not the first time that painted storks have deserted Keoladeo. In the 2006-2007 season, the park was affected by the drought that hit Rajasthan. Birds abandoned the park and returned only two years later. More than 200 years ago, Maharaja Surajmal of Bharatpur created the Keoladeo wetland by constructing the Ajan Bund on the confluence of the rivers Gambhir and Banganga. Post Independence and after the formation of Rajasthan, the park receives water from other sources as well. One is the Goverdhan drain, an inter-state flood control channel. 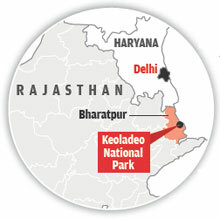 In 2012, when the drain started to bring water to Keoladeo, it was supposed to end the park’s water woes. This year, the park has not received any water at all from the drain. “Besides, the water brought in by the drain passes through villages, bringing along pollutants,” says Joy. The other source of water to the park has been the Chambal-Bharatpur drinking water project. Water from the project is specially pumped to the park. This season, the park received 160 million cubic feet (mcft) of water from the project. This was not enough. The wetland area, which constitutes nearly a third of the park, requires nearly 550 mcft of water a year. Ecologists, including Joy, also say that the Chambal water does not have an abundance of prey for the birds. 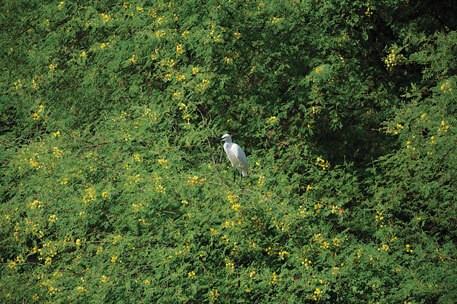 Experts believe that water from the Gambhir river is the richest source of fish, crucial for the birds’ survival. The park, therefore, needs water from the Panchna dam in Karauli district of Rajasthan every year to sustain larger numbers of birds. But this has not been the case. “Release of water does not come under my ambit,” says the field director. S S Dhanker, a retired state irrigation department employee and resident of Bharatpur, suggests a shorter alternative route that would bring the Chambal water from the Kota Barrage to the Gambhir via Sawai Madhopur. “This way there will be no requirement to pump the water,” he explains. Due to the scarcity the annual flushing of water has not happened in Keoladeo for more than 20 years. This has resulted in increased salinity. Droughts in 2002, 2007 and 2014 have also encouraged the growth of invasive terrestrial weeds in the wetland. Dhanker, who has written several letters to park authorities, hopes something is done. Else, the park could lose its heritage status. I have visited Keoladeo NP two years ago for a study under UNESCO World Heritage Programme ...have noticed that with drought repeating every year and increase of invasive species both territorial and aquatic were serious problems. Though several measures were planned like water from Govardhan dam, Chambal drinking water project but present report suggests these measures are yet to give result. At that time we noticed that birds were found in satellite wetlands in and around Bharatpur.. Can anyone please tell whether bird number has increased in the satellite wetlands? Also, proper study need to be done on deterioration of Keoladeo as it receives good fund and good management for a small National Park - SEJUTI SARKAR DE, Society for Natural Resource Management and Community Development (SNRMCD). Devika an Environmentalist and Species conservationalist. Birding census and ecological habitat surveys should be done by a combined team. All over India recording bird counts either in January or February should give representative samples on baselining number counts each year. Then we could decide whether there is an increase, shift in birds due to climate change or other human factors. Please protect sensitive species at breeding seasons. Digging and construction work at that time could have been avoided.